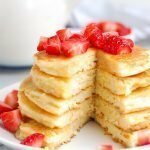 These best fluffy paleo pancakes are the best homemade pancakes ever! Made with almond flour and tapioca flour, they turn out perfectly light, fluffy, golden, and can be made with coconut or almond milk! In a large bowl, mix together almond flour, tapioca flour, baking powder, cinnamon, and salt. In a small bowl, whisk eggs. Add in vanilla and milk of choice. See note for differences in milk. Add wet ingredients to dry ingredients and stir until combined. Batter will be thick! Heat a pan with 1 tbsp butter or coconut oil. Once hot, scoop 1/4 cup batter onto pan. If you want to add in any fruit or chocolate, now is the time. Let pancake cook slowly, and once bubbling or if you peak and see golden brown, flip over. This will take about 3-4 minutes and will get quicker as you cook more and more pancakes. Cooking the pancakes low and slow allows them to get the nice golden brown and cook in the middle. Once cooked all the way though, take off the heat. Serve with butter, maple syrup, and more fruit and enjoy. If you’re going to use coconut milk, use a can!! Shake the can up before measuring so you can use both the liquid part and the hard cream part that settles at the top. If they are still separated when you open the can, just mix it up with a spoon so you have a thick white liquid.